As places of quiet contemplation and reflection, Japanese Zen gardens seem the perfect counterbalance to the stresses of an always-on, hyper-connected existence. 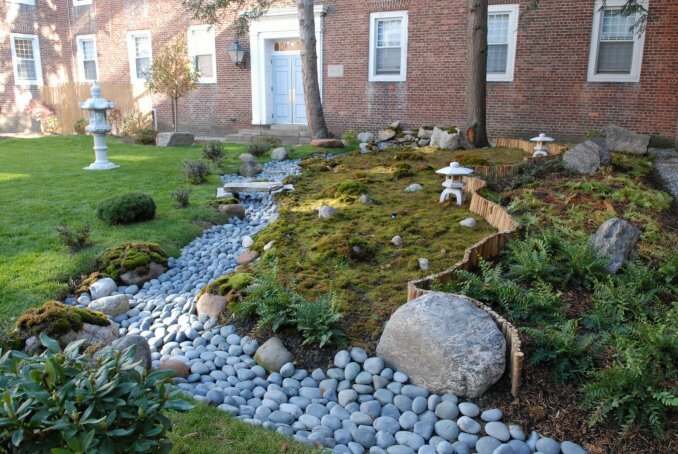 While a number of universities have Zen Gardens, in the U.S. such sanctuaries remain largely the provenance of museums and botanic gardens. Their counterparts in Japan continue to be associated with religious temples, as they have for more than a millennium. 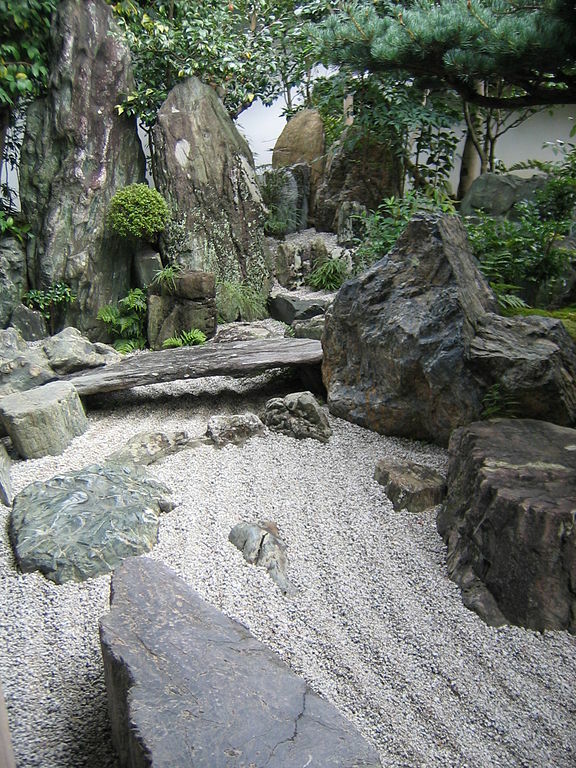 Japanese rock gardens were first developed during the 8th century and often mimicked the gardens of China’s Song Dynasty. Tiny lakes and islands covered with moss and precisely manicured grasses and shrubs combined with larger rocks and gravel beds intended to represent nature’s spirit on a more intimate scale. 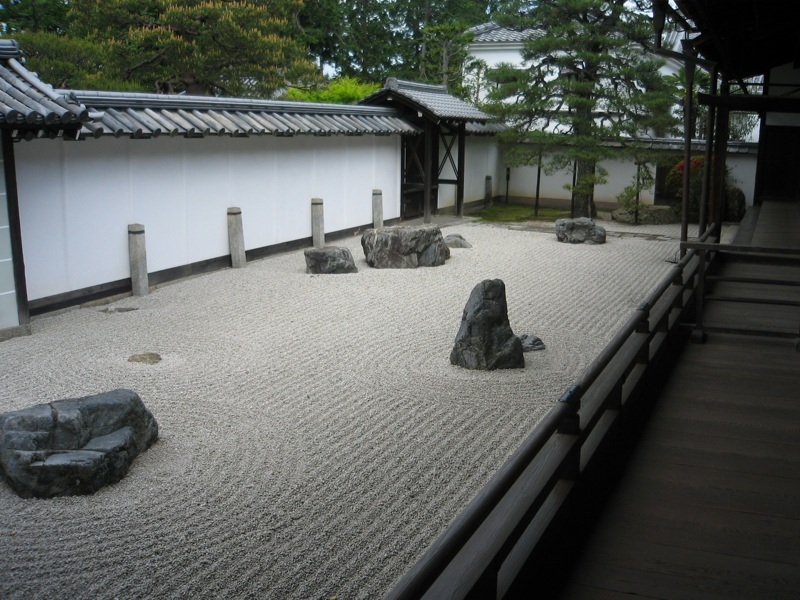 During the 14th century, Classical Zen gardens that were created in Rinzai Zen Buddhist temples began to showcase a simpler style incorporating large boulders and painstakingly groomed gravel. 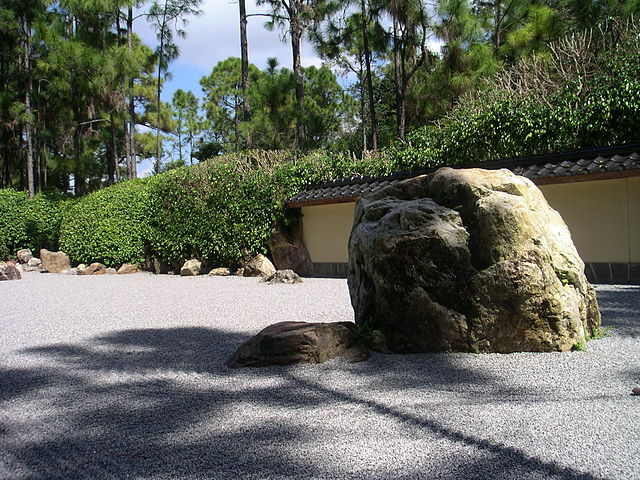 These rock gardens, also known as dry landscape gardens or karesansui contain elements that are intended to represent larger landscapes and inspire meditation and contemplation. Large stones often represent mountains or mountain formations or waterfalls, and the raked pebbles evoke watery waves. 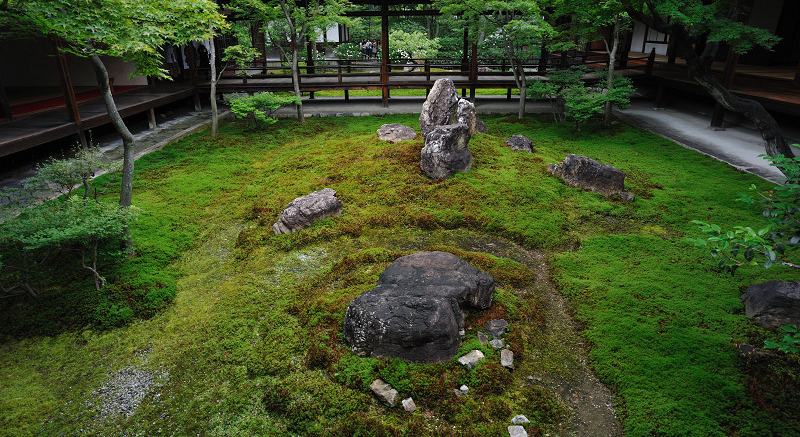 Also known as the Moss Temple, Saiho-ji’s famous moss garden is an example of an early Zen garden. Created in the 14th century, the moss formed later when the temple went in to disrepair. 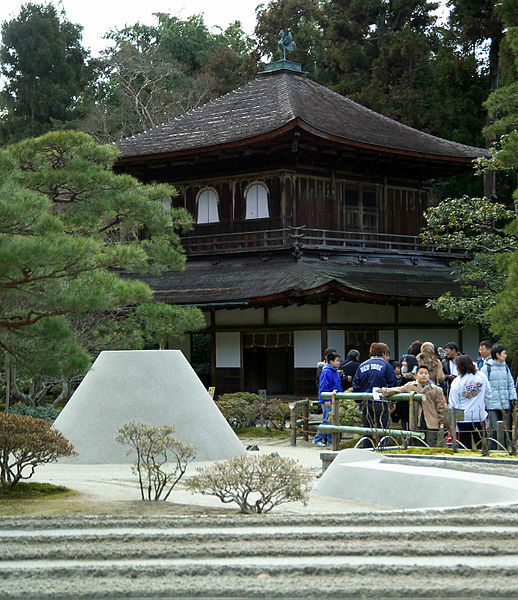 The northern temple grounds also house a Zen rock garden, which was arranged by the famed Japanese rock gardener, Muso Soseki. 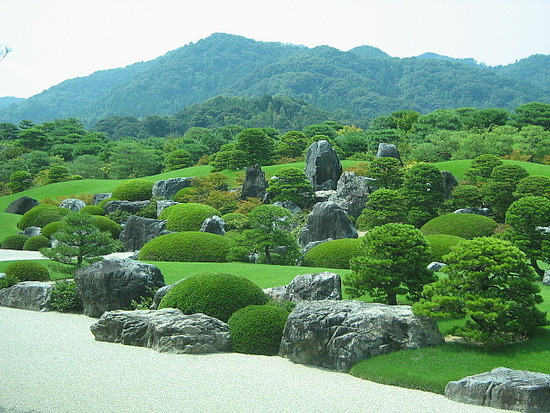 Home to six separate gardens, the Adachi Museum of Art’s landscapes are filled with plants and rocks that were carefully collected from across Japan by the museum’s founder, Adachi Zenko. Closely linked to traditional Japanese ink paintings, Zenko viewed these gardens as unrolled scrolls. The museum’s dry landscape garden combines a number of elements including shrubs and large rocks meant to represent a larger river landscape with a towering waterfall. Tenryu-ji, known as the Temple of the Heavenly Dragon has a garden with a large pond built by Muso Kokushi during the 14th century. 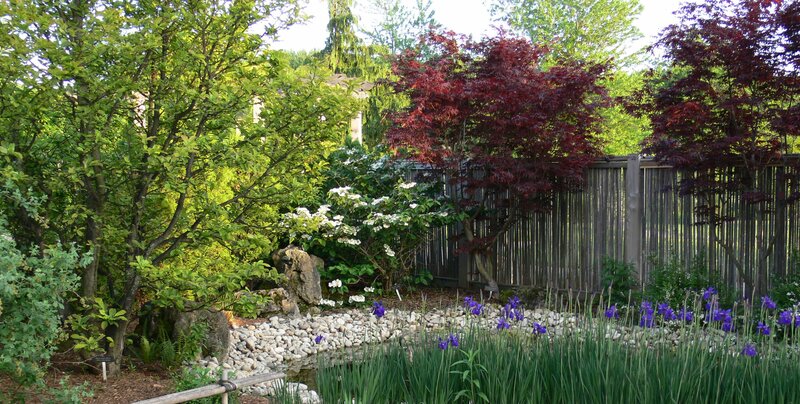 Reflections of maple trees hover across the surface of the pond, and a variety of boulders and stones create a dry waterfall within the garden. 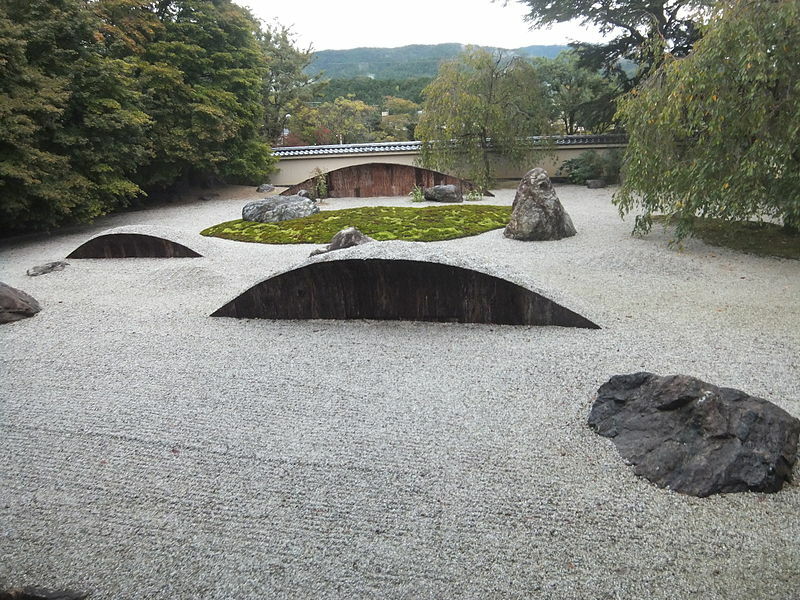 Tenryu-ji displays the gradual transition from representational Zen gardens to a more abstracted and artificial presentation. A forest garden located on Washington State’s Bainbridge Island, the Bloedel Reserve’s traditional Japanese garden includes lakes, lawns, and a moss garden. Meticulously landscaped, the grounds include a meditative Zen garden in a rectangular form with a number of large boulders surrounded by carefully groomed white gravel. 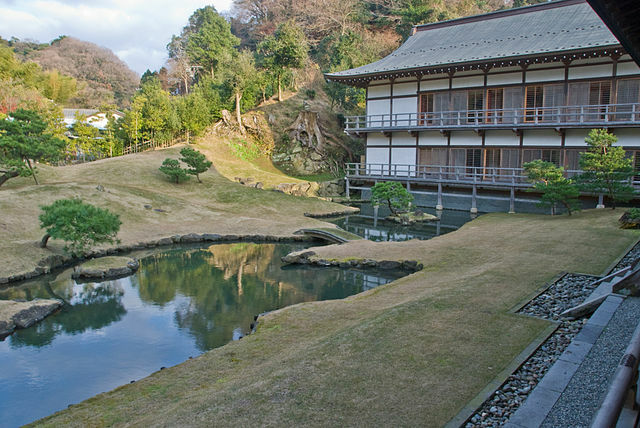 Located on the edge of the eastern mountains of Kyoto, The Silver Pavilion is situated on some of Japan’s most beautifully landscaped grounds. With a variety of walking paths, the temple houses a large sand garden that has a two-meter cone thoughtfully sculpted from silver sand. The cone, intended to represent Mt. Fuji, provides one of the garden’s most important elements, and has become a touchstone for meditative contemplation. 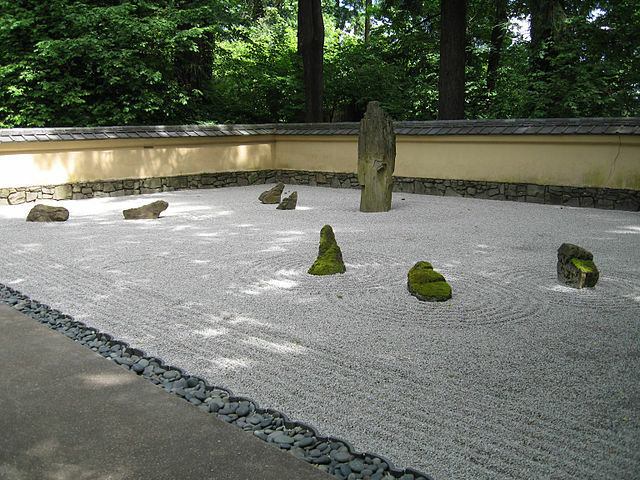 With five distinct landscaped areas, the Portland Japanese Garden’s Sand and Stone Garden exhibits many of the traits of a traditional Zen garden. Light-colored gravel and large weathered stones are contained within a wall and are carefully groomed with a rake to resemble faint waves of water. Historically, these raked sand gardens were intended for spiritual reflection and were often affiliated with a monastery or temple site. New Zealand’s Hamilton Gardens contains five separate garden collections including the Paradise Garden Collection, which houses The Japanese Garden of Contemplation. 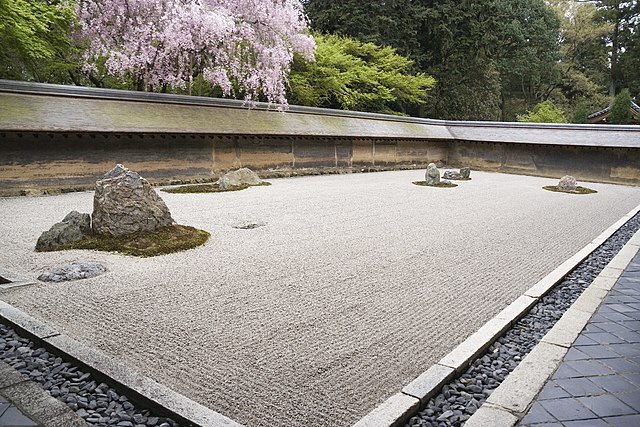 Modeled after many of the Zen gardens found in Japan’s temple complex, the garden embraces traditional Zen garden attributes like minimal vegetation and large standing rocks. Embracing austerity and stillness the garden evokes a sense of stillness and calm. 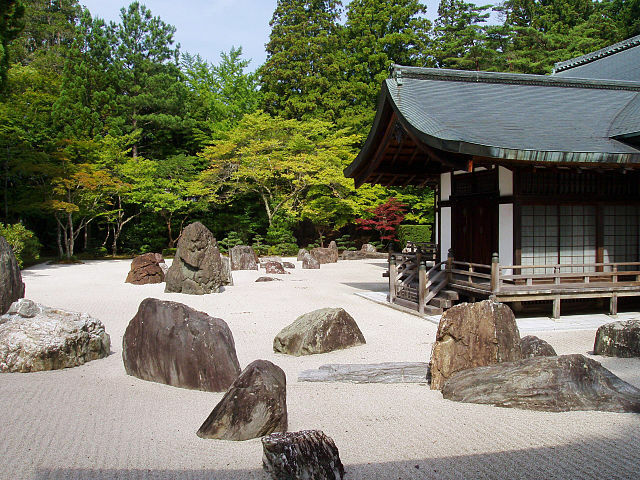 A Jodo temple founded in the 13th century, Komyo-ji’s rock garden is located next to the temple’s main hall. White raked gravel sits quietly beneath eight carefully placed boulders that represent various saints and gods. Usually affiliated with Rinzai sect temples, Komyo-ji’s rock garden is unusual and unique inside this Jodo temple, and is often frequented by the temple’s large population of stray cats. Known as the first of the Five Great Temples of Kamakura, Kencho-ji was built in the middle of the 13th century. The pond, a focal point within the temple’s Zen garden, is shaped like the Chinese character for mind, and was designed by the famous Japanese garden designer Muso Soseki. The Tofuku-ji temple complex has 24 sub-temples as well as a number of gardens. Designed in the late 1930s by garden designer Mirei Shigemori, the temple’s rock garden is comprised of 9 large boulders resting above earth-colored pebbles. Four of the rocks symbolize the Elysian Islands and the five remaining rocks represent the five sacred mountains of Buddhism. Founded by priest and garden designer Moso Soseki in the 14th century, Zuisen-ji is situated in a valley surrounded by mountains. The temple’s Zen garden, also designed by Soseki, utilizes the site’s nearby natural rock formations to create a wall around the garden. The enclosure has a pond with two bridges, and a cave has been carved into the northern rock wall, which overlooks the pond, and is used for meditation purposes. A sprawling temple complex with nearly 40 sub-temples and smaller buildings, Myoshin-ji’s Taizo-in temple is best known for its stroll garden and it famous dry landscape garden. Angular rocks representing cliffs align with smaller stones and pine and evergreen trees to evoke the sense of a larger river landscape. 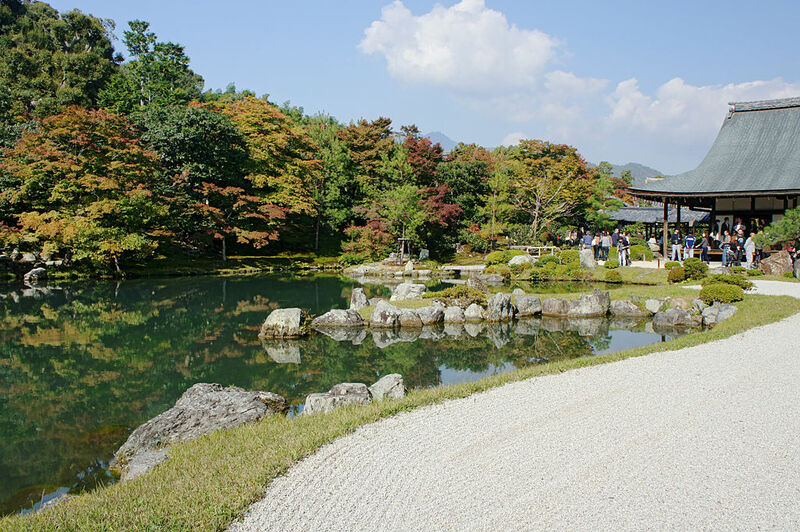 Narabigaoka Hill can be seen in the distance, and like many Zen gardens, Taizo-in’s dry landscape garden is thought to be a direct three-dimensional reproduction of a traditional Japanese landscape painting by Kano Motonobu. Another great temple complex, Daitoku-ji, also known as The Academy of the Great Immortals, was built in the 16th century. Daisen-ji, a smaller temple in the complex is recognized for its rock garden, which closely resembles those found in China. Thought by scholars to represent the metaphorical journey of life, Daisen-ji’s rock garden includes two cone shaped hills of white gravel and a number of smaller landscaped arrangements. Beginning with a cluster of rocks, this waterfall is believed to signify birth, the waterfall then leads into two gravel rivers, scattered with large boulders denoting life’s obstacles. Finally leading to a bed of raked pebbles, the metaphorical rivers flow into an open ocean, signifying the end of life. 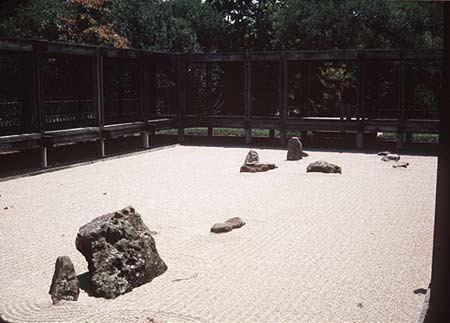 Nanzen-ji, the headquarters of the Nanzen-ji branch of Rinzai Zen, is known for its traditional rectangular-framed rock garden. Tiny white pebbles, groomed with a rake, suggest quiet ocean waves or the gentle wind across a pond. The garden also has a number of boulders, carefully placed across the field of gravel and intended to represent mountains or islands. 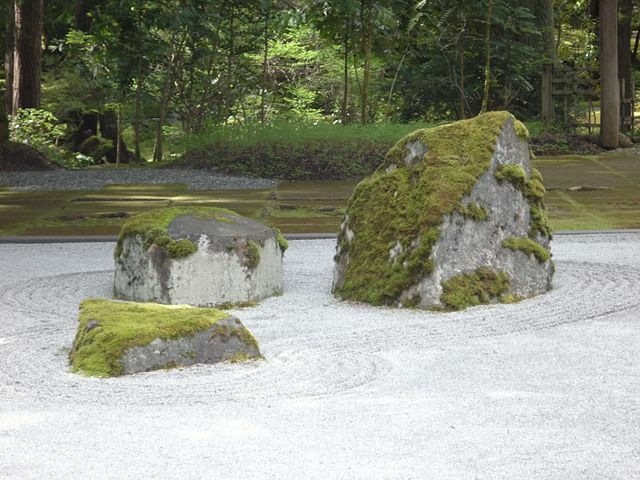 Nanen-ji’s rock garden inspires meditation and reflection. 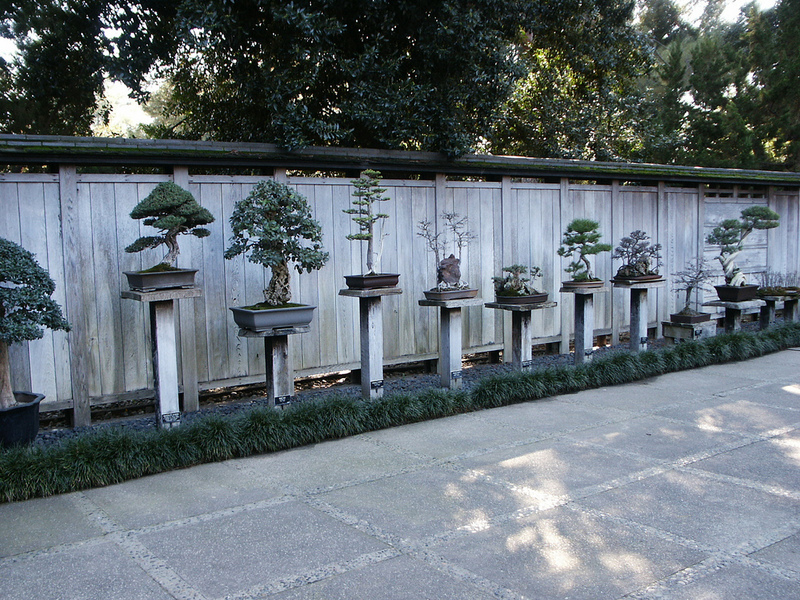 San Marino’s Huntington Library has a number of botanical gardens onsite including a bonsai collection and a Zen court. Similar to a traditional Zen garden, the rectangular court has a wall surrounding it with plantings around the edge. Unique to this particular garden is the stone walkway and stone benches allow visitors to sit and observe the combed gravel bed that sits within the garden walls. Located on top of Mt. Koya, Kongobu-ji is known as the Temple of the Diamond Mountain. The temple is home to Banryutei, Japan’s largest rock garden covering nearly 2400 square meters. The garden’s arrangement, composed of 140 granite stones, was completed in 1984. The stones are presented to suggest two dragons descending from the clouds to protect Kongobu-ji. 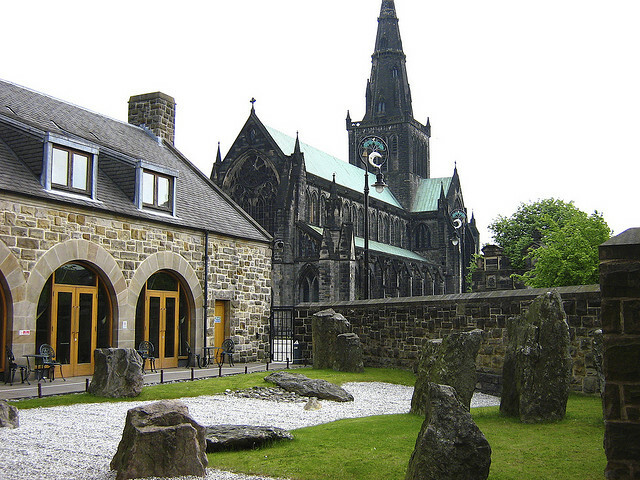 Home to the first Zen garden in the U.K., the St. Mungo Museum of Religious Life and Art is the only public museum devoted to the subject of religion. 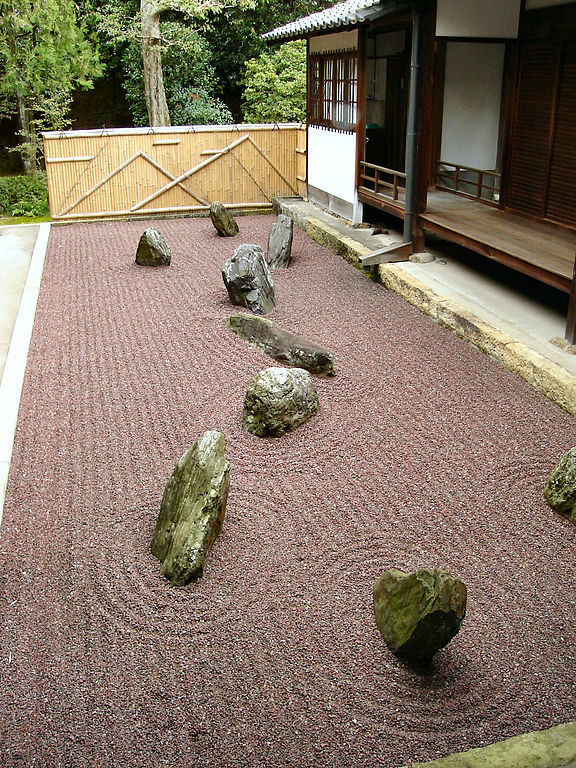 The museum’s Zen garden, which was carefully modeled after those found in many of Japan’s Buddhist temples, has a small stone wall surrounding it as well as a number of flat and weathered stones. Carefully raked white gravel and neatly manicured grasses flow throughout the landscape, and visitors are encouraged to sit and contemplate the space while enjoying a cup of tea from the museum’s café. Japanese-American artist Isamu Noguchi was best known for his minimalist sculptures featuring cut and manipulated stone. While living in New York, Noguchi maintained a studio in Japan, near to the home of a stonecutter, whose expertise would help guide the artist through numerous projects. Included on the site of Noguchi’s studio is a small rock garden composed of white gravel and a number of large granite boulders in a variety of shapes. Some of these rocks have been smoothed and manipulated by Noguchi, while others maintain their natural form. The garden is a compelling modern interpretation of a traditional Zen landscape. 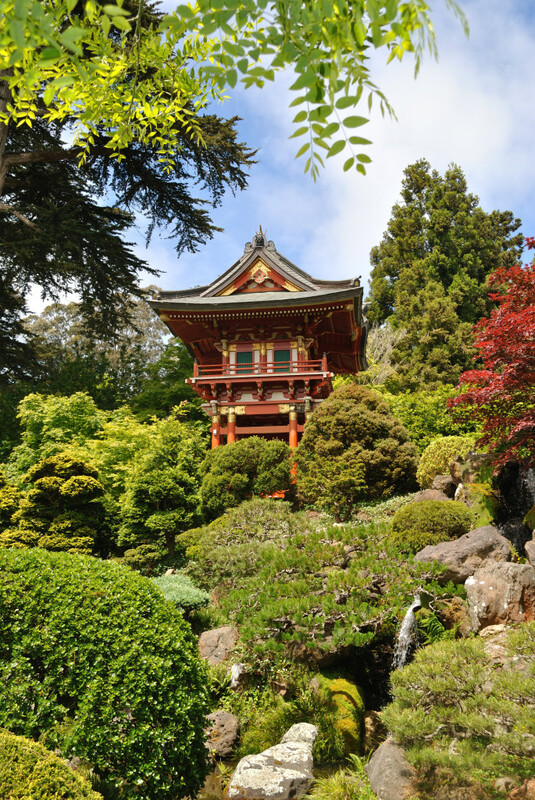 Golden Gate Park’s Japanese Tea Garden has a small rock garden within its walls. Japanese immigrant and gardener Makoto Hagiwara, who also oversaw the initial building of the garden in the late 19th century, maintained the garden from 1895 until 1925. 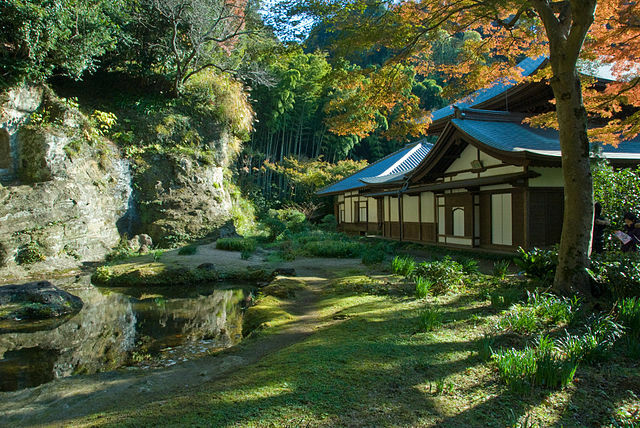 Founded in the 13th century by Yousai, Kennin-ji is the oldest Rinzai Zen temple in Kyoto. 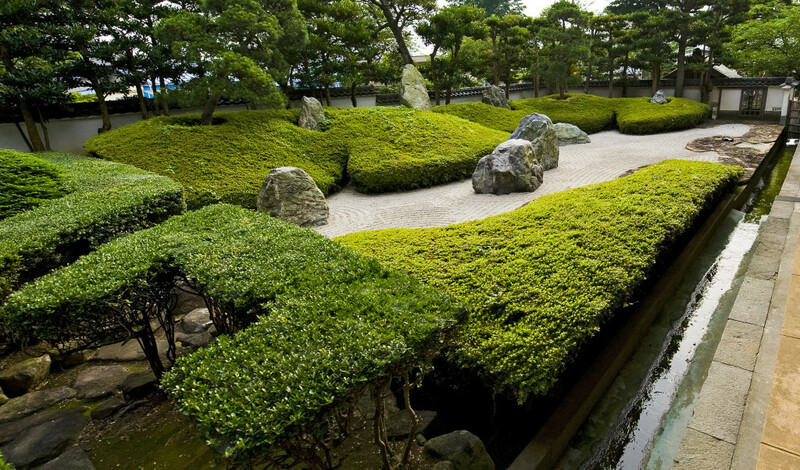 The square garden was inspired by Sengai Gibon’s caliigraphy and incorporates three large stones, a mossy ground cover, and a number of surrounding maple trees. Each season as the leaves change, the landscape transforms and becomes alive. 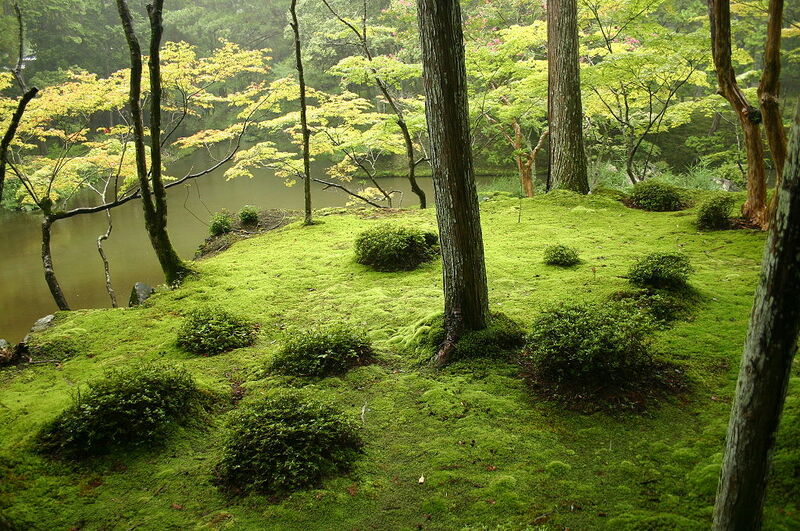 Unlike many Zen gardens, Kennin-ji’s garden is lush and green, and shows no evidence of a gravel bed beneath the moss. Known as one of Japan’s Places of Scenic Beauty, the garden at Taisan-ji has a number of large rocks and boulders. Perhaps intended to represent the bottom of a riverbed or great mountain range, the landscape is meant to promote contemplation and meditation. Creating metaphorical land formations within the small space of the garden, the garden’s designer intended the space to be enjoyed from a single point beyond the garden grounds. The only museum in the United States dedicated to the living history of Japan, the Morikami Museum’s gardens cover nearly 200 acres. Created by Hoichi Kurisu between 1999 and 2001, the museum’s six distinct Japanese gardens include Early and Late period rock gardens as well as an extensive bonsai collection, and a modern romantic garden. 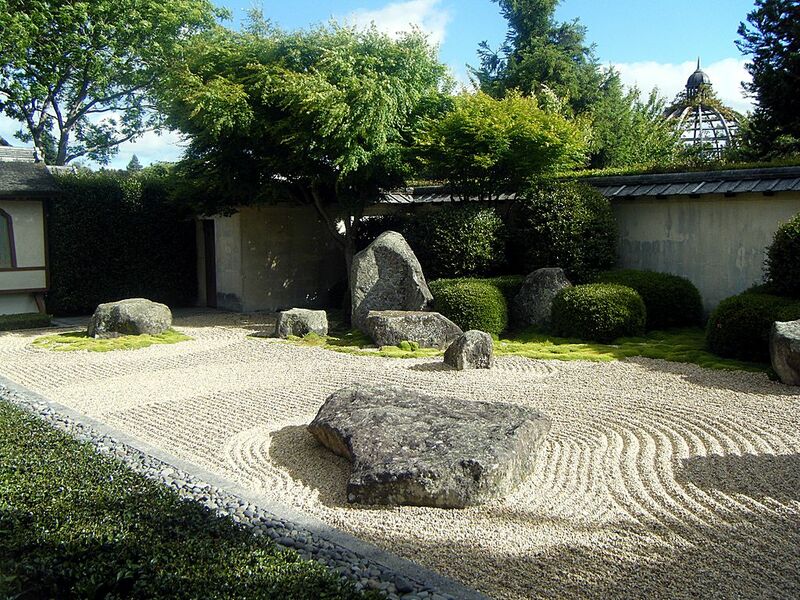 The dry landscapes of the two rock gardens incorporate traditional elements of Zen garden design including pristinely groomed gravel and large naturally shaped boulders. Absent of any greenery, the garden is located within a walled structure where visitors may sit and consider the serenity of their surroundings. The stone garden of Jisso-in has a number of modern features that make it unique among this collection of Zen gardens. 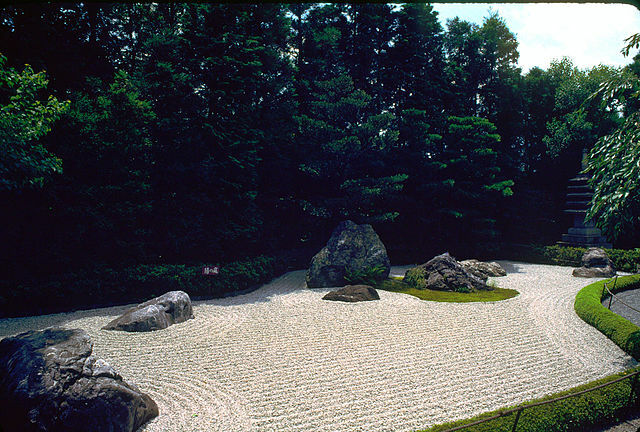 Containing the customary pebbles of similar gardens, the Jisso-in garden contains a number of large moon-shaped stones that appear as though they are partially submerged below the gravel’s surface. Mimicking giant ocean waves, these man-made stones rise up alongside the garden’s mossy island and larger, more naturally formed stones. The garden has a surrounding wall that is lined with trees, and its unusual elements contribute to the garden’s compelling elegance. An excellent example of an American interpretation of a Zen garden, the Fort Worth Botanic Garden has two distinct dry landscape gardens. Large boulders represent the Rocky Mountains and smaller pebbles line the valleys in between. Flowing like a waterfall, and perhaps modeled after Daisen-in’s famous Zen garden, the arrangement of elements produces a smaller version of the Colorado River’s run into the Grand Canyon. 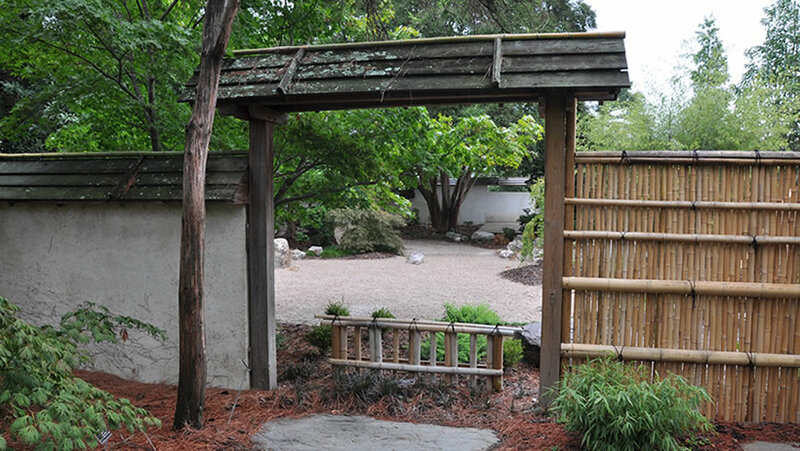 Told through stillness and careful arrangement, the Fort Worth Botanic Garden’s Zen gardens are an excellent example of a Japanese tradition in America. Also called the Temple of the Dragon at Peace, Ryoan-ji has what is known as the most famous Zen garden. The refined dry landscape has fifteen enormous stones placed inside 248 square meters of highly polished white gravel. The monks residing at the temple groom the gravel each day and the stones are arranged within the space in five separate groups. Like most Zen rock gardens, Ryoan-ji’s garden is to be seen from a single vantage point on the veranda of the Abbott’s residence. 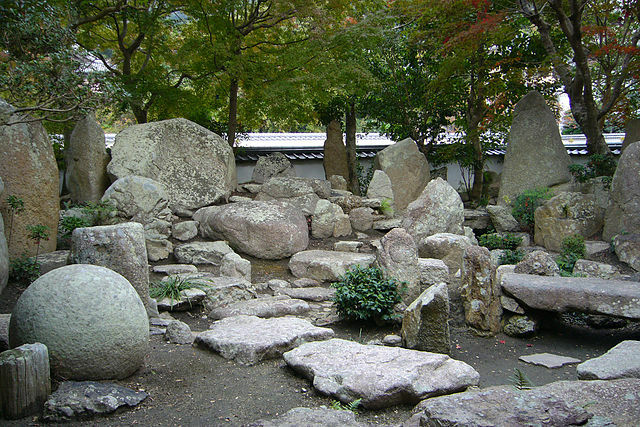 The rocks of the garden were arranged so that only fourteen of the fifteen stones may be viewed at any given time from any angle. This arrangement ensures that only through attaining enlightenment will one see all fifteen stones simultaneously.